- The Border Collie - The most intelligent breed of all dogs considered by scientists. Also known as the Scotch Sheep Dog, originally from the Border Country between Scotland and England , they have been arround for more than a hundred years, Queen Victoria in the second half of the 19th century was very fond of the Scotch Sheep Dog breed due to their great abilities. Prized for there intelligence, instinct, extraordinary energy and eagerness to work.They were extremely valuable to farmers and shepherds, being the world's number one sheepdog herder developing an originaland unique style of fetching and gathering stock with a wide outrun sweeping movement. 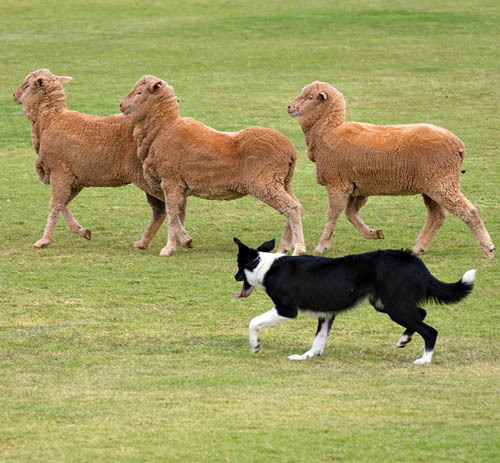 The greatest abilities of Scotch Sheep Dogs is to work out of sight of their master due to the extraordinary instinct they own. This dog breed is still at the moment used for these jobs all over the worlde. These dogs are not recommended for households with small children and are better off with someone that's devoted to work with them, they rather be living on farms and have a job to do than sit arround and do nothing. - Click here to know even more about the Border Collie Dog Breed.